The Fitness Event of the Year has finally returned to The Parks Health & Fitness! 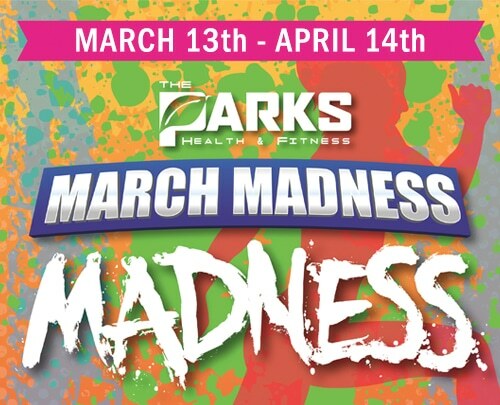 Parks March Madness Madness is exactly what you would expect… complete fitness and health madness! Over the course of 5 weeks teams of two compete for our grand prize and the title of March Madness Madness champion. The best part is you don’t have to be a member to join in the fun. Members and Non Members alike will compete for this years top prize. Your entrance fee includes daily coaching, two specialty classes, weekly nutrition and health seminars, weekly outdoor Saturday boot camps, and so much more! Enroll today in the BEST fitness competition money can buy. Join in the fun and improve your health while you are at it. Fill out the form for more information or ask any of our Parks Employees for more details. Competition starts March 13th so sign up soon before it fills up! Good Luck!